Edmund Anthony Cutlar Purdom (19 December 1926 – 1 January 2009) was a British actor. He worked first on stage in Britain, performing various works by Shakespeare, then later in America on Broadway, until making his way to Hollywood, and eventually spent the remainder of his life appearing in Italian cinema. He is perhaps best known for his starring role in 1954's historical epic The Egyptian. By taking over important roles exited by Mario Lanza and Marlon Brando, Purdom was known by the mid-1950s as "The Replacement Star". His daughter Lilan Purdom became a journalist for French TV Channel TF1. She is the author of the book "Hollywood Garage" that relates the tumultuous career of her father. The book is published in English and in French. Purdom was born in Welwyn Garden City, Hertfordshire, England and educated at St. Augustine's Abbey School, Ramsgate, Kent, then by the Jesuits at St. Ignatius Grammar School and Welwyn Garden City Grammar School. He began his acting career in 1946 by joining the Northampton Repertory Company, appearing in productions which included Romeo and Juliet and Molière's The Imaginary Invalid. Followed by two years of military service where he joined the Army Pool of Artists. He then joined the Royal Shakespeare Theatre at Stratford-upon-Avon for two seasons. He was seen by Laurence Olivier who offered Purdom a chance to tour in the US. In 1951–52, Purdom appeared in small roles with the Laurence Olivier/Vivien Leigh company on Broadway in Shakespeare's Antony and Cleopatra and Shaw's Caesar and Cleopatra. His good looks brought him to the attention of Hollywood. Warner Bros wanted to test him and offered him $600 advance to come to Hollywood. He did a screen test directed by Michael Curtiz from a scene from Force of Arms but Warners was not interested. Because Purdom had left his play he did not have the fare to return to Britain so he decided to stay in Hollywood. Universal tested him for the part of the leading girl's brother in The Mississippi Gambler but decided he was too British. 20th Century Fox tested him for a role in My Cousin Rachel. MGM offered him a small role in Rhapsody, which he turned down to work at Warner Bros., but Warners lost interest in him. "I was so broke," Purdom recalled, "that I couldn't afford to pay the doctor's bill when my daughter was born. I had no money for bus fare. I had to walk from studio to studio looking for a job. Once we were evicted for not paying the rent." He managed to get a small part in Julius Caesar at MGM. George Cukor recommended him to Charles Brackett for the small role of Charles Lightoller in Titanic (1953). This brought Purdom to the attention of executives at MGM who signed him to a long term contract. Mario Lanza was fired from the lead role in a new version of The Student Prince (1954). Lilian Burns suggested Purdom for the part, and he did a successful test directed by George Sidney. He was cast opposite Ann Blyth. The film was directed by Richard Thorpe. Purdom lip-synched to Lanza's singing voice. Advance word on The Student Prince was promising, and when 20th Century Fox needed an actor at the last minute to replace Marlon Brando as the title character in The Egyptian, their most lavish production of 1954, Purdom was cast. He was chosen over John Derek, John Cassavetes and Cameron Mitchell. MGM's head of production Dore Schary announced they would build up Purdom as a star. He was cast in three films: another MGM musical, Athena; the title role in the biblical epic The Prodigal, MGM's most lavish production of 1955, opposite Lana Turner; and the swashbuckler The King's Thief (1955), in a role originally meant for Stewart Granger. There was also some talk he would appear in the remake of Ben Hur. The Student Prince was released and became a hit. Purdom was called "the most promising new star in Hollywood". Hedda Hopper called Purdom "the most surprising and notable figure this year in Hollywood... a fine actor in the great romantic tradition." Schary later wrote in his memoirs that "Lanza's recordings were the prime ingredient for the picture's success, and that success went to Purdom's head. He believed he was responsible for the happy result. He asked for a new contract. We denied it. He asked for a release. We granted it." Another contributing factor may have been that while The Student Prince had been a hit, The Egyptian was a box office disappointment. Athena, The Prodigal and The King's Thief were all flops. There was more bad publicity when he had an affair with Linda Christian (when she was married to Tyrone Power) leading to him divorcing his first wife. The split was bitter and public, his wife later suing him for child support. Purdom argued for a reduction in child support, as he no longer had his MGM contract worth $40,000 a year. He told the court he had renegotiated it in order to seek more money by freelancing and that he was in debt for $11,500. He said MGM had an option on his services for three films over three years. "It is my greatest desire to get back in front of the camera at the present time," he said. He was announced for Loser Takes All (1956) but did not appear in the final film. For Allied Artists, Purdom made Strange Intruder (1956) with Ida Lupino. In 1957 he remarried, to Alicia Darr, who later got in a brawl with Christian. He continued to be sued for debts by his ex-wife and his lawyers. Purdom returned to Broadway, appearing in Child of Fortune, an adaptation of Wings of the Dove, for Jed Harris. Brooks Atkinson of the New York Times said Purdom "plays the part of the faithless suitor like a cultivated gentleman but his style is heavy." The play did not enjoy a long run. He went into television, starring as Marco del Monte in Sword of Freedom (1958) (also known as Marco the Magnificent), a swashbuckler made for ITC Entertainment in Italy. Purdom stayed on in Italy, where the film industry was booming. His films included Herod the Great (1959), The Cossacks (1960), The Loves of Salammbo (1960), Suleiman the Conqueror (1961) and Nefertiti, Queen of the Nile (1961). He also occasionally worked in England on such films as Malaga (1960) and The Comedy Man (1964). In 1962 he said "I couldn't stand Hollywood. The people, their status, symbols and public image were too much. I walked out. Perhaps I should have been more patient." Hedda Hopper wrote in response to this, "the truth is, he did his best to become a star here, but he didn't make the grade - even with Mario Lanza's voice; but he did walk out on his wife and family and start gallivanting around with Linda Christian. I'll bet he'll come hopping back if anyone crooked a finger." He eventually married Christian in 1962 but they divorced the following year. He continued to work extensively in Italian B-films, on television and as a voice dubbing actor for many years (recording dialogue translated from Italian into English for sales of Italian films in English-speaking countries). He also had roles in TV movies and miniseries, such as Sophia Loren: Her Own Story (as Vittorio De Sica) and The Winds of War. In 1984, he directed his first and only film, Don't Open till Christmas. He was also very active as a music recording engineer, including work on the soundtracks of such films as The Bible: In the Beginning..., as well as many classical concerts in Florence and Vienna. He is also credited for devising a technique transferring monaural sound to stereo. He narrated a popular short documentary on the life of Padre Pio. He also narrated the Christian documentary, 7 Signs of Christ's Return. Purdom died from heart failure on 1 January 2009, in Rome. Anita (Tita) Philips (or Phillips), the mother of his children, Lilan (b 11 October 1952) and Marina Ann (b 8 July 1954); married 1951, divorced 1956. Alicia Darr (m 1957) of Polish extraction. actress Linda Christian in 1962 (divorced 1963), former wife of Tyrone Power. In 2000 he married his fourth wife, the photographer Vivienne Purdom. His daughter Lilan Purdom became a journalist with the French television channel TF1. Goodyear Playhouse (1952) (TV series) - episode "The Medea Cup"
^ Bergan, Ronald (5 January 2009). "Obituary: Edmund Purdom". The Guardian. ISSN 0261-3077. Retrieved 30 January 2019. ^ a b Berch, Barbara (22 August 1954). "ON PAGING A PARTY NAMED PURDOM". New York Times. p. X5. ^ a b Hopper, Hedda (4 July 1954). "The Find of the Year\s-: EDMUND PURDOM". Chicago Daily Tribune. p. f13. ^ "CHANGE OF LUCK LED TO STARDOM". The Mail. Adelaide: National Library of Australia. 31 July 1954. p. 64. Retrieved 19 April 2014. ^ Bergan, Ronald (5 January 2009). "Edmund Purdom: British character actor famed for his roles in The Student Prince and The Egyptian". The Guardian. Retrieved 2 June 2009. ^ Schallert, Edwin (6 September 1953). "Purdom Personality Matches Lanza Voice: Englishman Will Play the Role of Hero in 'The Student Prince'". Los Angeles Times. p. C3. ^ Pryor, Thomas M (15 August 1953). "PURDOM WILL STAR IN 'STUDENT PRINCE': English Actor Cast by Metro for Title Role, but Lanza's Voice Will Be Heard". New York Times. p. 8. ^ Pryor, Thomas M (26 February 1954). "NICHOLS HONORED BY WRITERS GUILD: Scenarist Is Awarded Laurel Achievement for His Work in Industry and Union". New York Times. p. 15. ^ Pryor, Thomas (1 February 1954). "METRO STRESSING CINEMASCOPE USE: Five of Eight Films to Be Done in April and May Set for Wide Screen". New York Times. p. 19. ^ "Drama: Purdom Selected as Star of 'Ben Hur'". Los Angeles Times. 17 April 1954. p. 14. ^ Schary, Dore (1979). Heyday. p. 267. ^ Hopper, Hedda (10 November 1954). "Edmund Purdom's Marriage Near End: Actor's Wife Changes Mind; Gets Attorney to Sue for Divorce". Los Angeles Times. p. 2. ^ "Wife of Edmund Purdom Gets More Support Fund: British-Born Blonde Wins Increase From Actor After Bitter Wrangling in Court". Los Angeles Times. 23 July 1955. p. 6. ^ "COURT REFUSES CUT IN PURDOM ALIMONY: Judge Turns Down Appeal for Reduction After Hearing That Star Canceled $40,000 Deal". Los Angeles Times. 3 December 1955. p. 3. ^ Watts, Stephen (25 September 1955). "OBSERVATIONS ON THE BRITISH SCREEN SCENE: Graham Greene Returns to Production -- New Star Is Born -- Other Matters". New York Times. p. X5. ^ "Brawl Figure". Chicago Daily Tribune. 26 September 1959. p. w9. ^ "Linda Christian, Purdom Once Wed, Court Told: Ex-Wife of Actor Makes Revelation in Affidavit Supporting Contempt Citation PURDOM CASE". Los Angeles Times. 7 August 1958. p. B1. ^ Atkinson, Brooks (14 November 1956). "Theatre: An Old-Fashioned Tale: 'Child of Fortune' Bows at the Royale Novel by Henry James Adapted by Bolton". New York Times. p. 41. ^ Hopper, Hedda (15 November 1962). "Purdom Raps Hollywood; Hedda Talks Back". Chicago Daily Tribune. p. c14. ^ "Linda Christian Sues Purdom for Divorce". Los Angeles Times. 10 January 1963. p. 27. ^ "Edmund Purdom Seeks Divorce". New York Times. 4 January 1955. p. 24. ^ "Mrs. Purdom Receives Final Divorce Decree". Los Angeles Times. 22 March 1957. p. B1. 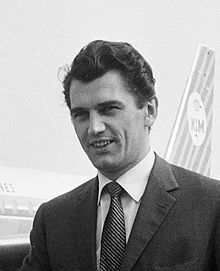 Wikimedia Commons has media related to Edmund Purdom.